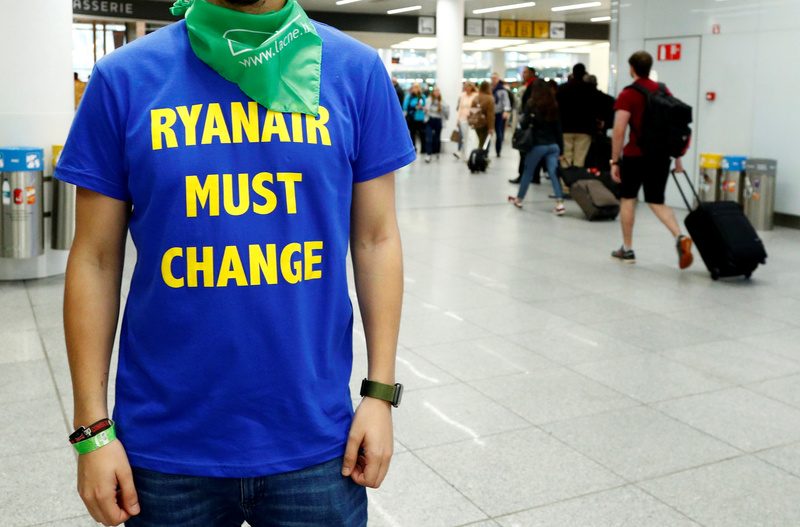 A protester poses in the departure hall of Zaventem international airport near Brussels during a strike by Ryanair workers of several European countries, Belgium September 28, 2018. Ryanair cut its forecast for full-year net profit by 12 percent on Oct. 1 and warned of more pain if recent coordinated strikes across Europe continue to hit traffic and bookings. Europe’s largest low-cost carrier by passengers said it expects net profit for the financial year to March 2019, excluding startup losses in Laudamotion, of 1.1 billion euros to 1.2 billion euros, compared with its prior forecast of 1.25 billion euros to 1.35 billion euros. Ryanair added that it could not rule out further disruption in the coming months, which may require the airline to lower full-year forecasts again and further scale back its winter capacity, which operates at a loss. Ryanair said fares in the three months to end-September had fallen by around 3 percent compared with its previous forecast of a drop of 1 percent. It now expects fares in the six months to the end of its financial year in March to be 2 percent lower. To cope with lower fares, higher oil prices and strike costs, Ryanair has trimmed its winter capacity by 1 percent, removing aircraft from bases in Eindhoven, Bremen and Niederrhein. Shares in Ryanair were down 8.19 percent at 12.04 euros by 0754 GMT on Oct 1. Shares in other European airlines also fell.